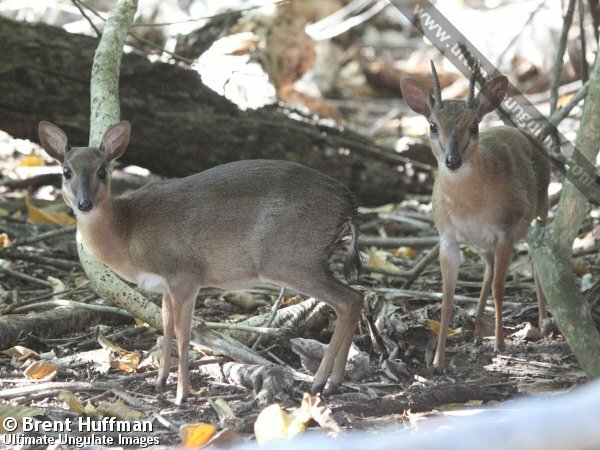 Recent genetic evidence (published in 2014) suggests that the suni and Bates' pygmy antelope (Neotragus batesi) are closely related to each other, but not to the third traditional member of the genus Neotragus, the royal antelope (N. pygmaeus). As a result, it has been proposed that the two former species be placed in a separate genus, Nesotragus. 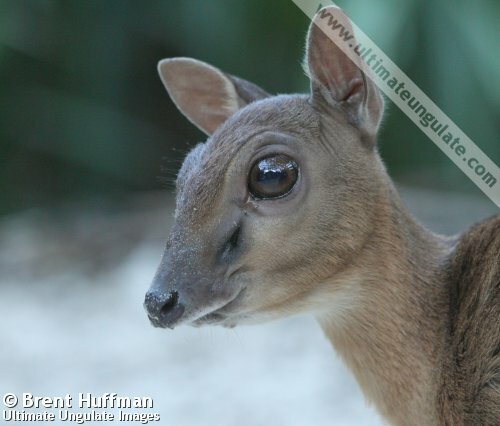 A very small antelope with a distinct crouching form and long, slender legs. The overall color varies between individuals from grizzled tan-brown to rufous, with the belly and inside surfaces of the legs being white. The tail is dark fawn (approaching black in some populations) above and white underneath. The large, rounded ears are thin-skinned and appear translucent pink in sunlight. The head is broad and tapers to a sharp point at the muzzle. Both sexes have long slit-like preorbital glands in front of the eyes; these are especially pronounced in adult males. Only males grow horns, which are short and spike-like, set wide on the skull. They are heavily ridged, and grow 6.5-13 cm long; there is a general trend for longer horns to be found in southern populations. 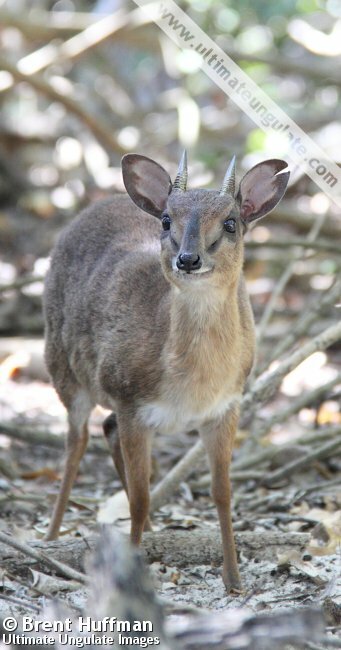 In its range, the suni is most often confused with the similarly-sized blue duiker (Philantomba monticola). 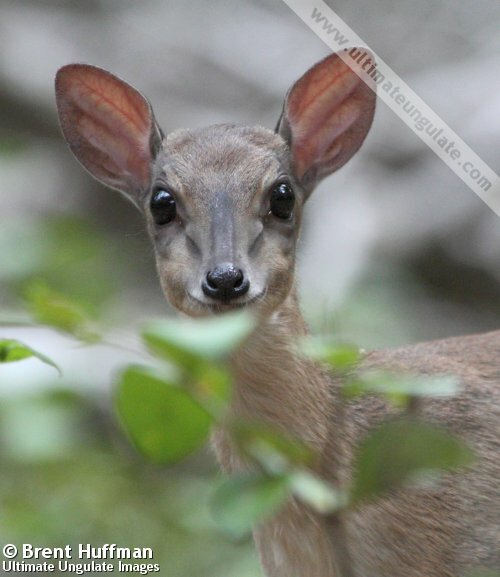 Their coloration is similar in poor lighting, although suni tend to be reddish while blue duikers have a greyish cast. 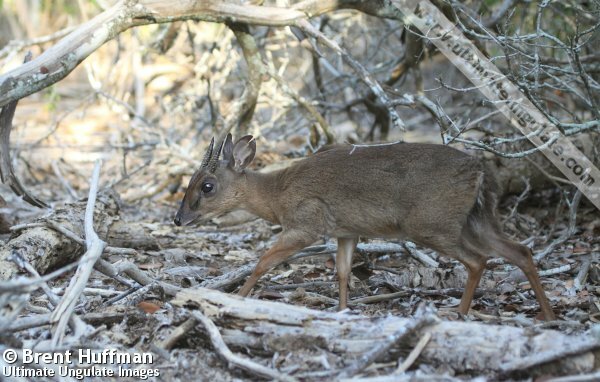 A key behavioural difference is that suni wag their tails from side to side, whereas blue duikers flick their tails up and down. Gestation period: 6-7 months (179-214 days recorded). Sexual maturity: At approcimately 1 year of age (for females). Life span: Up to 13 years (in human care). Suni are able to breed year-round, but have regional peaks in birth rates (September to December is South Africa, November to February in Tanzania). Young are cached in dense vegetation and are periodically visited by the mother for nursing. They begin sampling solid foods very early (as early as three days of age) and develop rapidly. Suni may be active throughout the day and night, but tend to be more active during dawn and dusk, as well as overnight. Regularly used pathways run through each home range, and sleeping spots are frequently reused. Males in particular mark their home ranges with dung middens and secretions from the large preorbital glands. They appear to be territorial, defending an area of 0.5-3.6 hectares from other males; these male territories may overlap those of several females, but there are no strong social bonds between them. In good habitat, population densities may exceed 17 individuals per km². Suni are sensitive to predators and typically freeze in position is a threat is detected; the alarm call is a sharp nasal whistle and is made immediately before fleeing. When feeding on their native diet, suni are able to meet their daily water requirements without drinking. Family group: Solitary or in breeding pairs. Diet: Leaves, typically picked from the forest floor. Fallen fruit and flowers, as well as fungi, may also be consumed. Main Predators: Most large predators, including birds of prey and large snakes. Forests and thickets in eastern Africa, at altitudes from sea level to 2,700 m. A closed canopy and significant density of woody stems are key habitat features. The approximate range is depicted in the map below. Threats: Overhunting by humans, feral dogs, habitat loss. The most recent population estimate (1999) suggests there are approximately 365,000 suni in the wild. 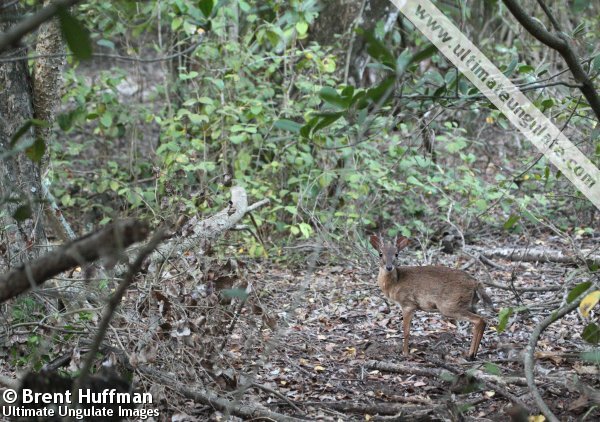 Suni thrive in disturbed and secondary forests, and can withstand relatively high levels of hunting. They are thus better able to deal with human disturbances than many other species.